Seems like they must have all disappeared or all be running and purring perfectly. If they all disappeared well that would be cool, cos my two would be worth a fortune, and I wouldn't mind that. No seriously, Merry Xmas to all you big cat lovers and owners and if Xmas isn't your thing, then Merry whatever. My 96 is almost ready for her final inside clean before heading to the paint shop, just a couple of circuits left to sort out, and then she can be restored to her former glory. God bless her and all her ride in her. Previous owner should have been banned from owning such a machine, I have honestly seen cars that people have lived in with cleaner interiors, but she will have her pride back soon. Just can't understand owning such a car and leaving it sat, almost in a field, for over a year. But her loss, my gain. Anyway to all of you, tidings of the season and in addition to the hard copy relay and fuse diagrams I now have and am happy to share for anyone who needs, I have links to all the ignition circuit wiring diagrams for the 95/96 xj12's also. Happy to forward those also, I know ignition issues can be a nightmare without the diagrams. Please remember the season, don't overdrink and eat, look after your cat, and may she long look after you. Not many to begin with. In 95-96 way less than a thousand produced badged XJ12, maybe even less than 700 units depending on who's numbers you are looking at. Now at 20+ years and most being owned by individuals without deep pockets they are disappearing quickly. This is a good thing on our (collectors) side of the fence, but not good for Jaguar. 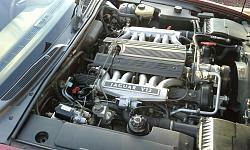 What a shame to see the flagship model for Jaguar in 95,96 slip away with no fan fare. Now with collecting XJ12's you better have a zen attitude because it's gonna be awhile before the pendulum starts swinging our way. I suspect it will take another 10 years to weed out the few that are remaining and then ours will be worth wait. You know I could have assembled 10-1970 Hemi Cuda 4 speed convertibles for under $30,000.00 all day long in the 80's. Would be nice to have them in the shed right now. While these XJ12's will never in my life time be worth what a 70 cuda is now you just never know when it comes to cars. The X305 has extremely low production numbers, this will work in our favor... eventually. I saw 4 for sale on Car Gurus this week 1 of 19. I believe in 96 there were only 180 shipped to the US. A small number to start with. You're right, it is a great shame to see this car disappearing. I love the style of these models, body and interior, and I feel very fortunate to own two of them. How is that project of creating a two door convertible coming along? Any recent pics? And remember to call me so I can copy the relay and fuse schematics for you and anything else you need. We big cat guys have to stick together. XJ12R is coming along Painfully SLOW. I am amazed at how many things come up that have to be done before I can spend time on the car. I take my hat off to those who are able to find time to spend on their projects. I am 1 week into a 3 week layoff and have not even picked up a wrench yet. Maybe today I'll finish my must do list and can get back to it. Join the club. I have just two circuits to rewire on the 96, side lights and turn signals, and was expecting to have that done before Xmas. I don't think it is going to happen. Having to spend time servicing equipment for work, a MUST do, can't afford down time on a short week. Then a house I bid on at auction and lost to some idiot who had never seen the property but out bid me anyway, and then finally failed to go through with, so now house is back on auction block this weekend, so having to keep eye on that. Plus being a wimp, I like heat, and pretty sure high 60's sounds good to a lot of people, but it feels pretty cold in Florida, so not too inclined to be spending more time than needed outside today. Anyway would be interested in seeing more pics of the conversion as you progress. I'm still purring as I drive my XJ12! But it is a lonely endeavour to own and drive an X305! 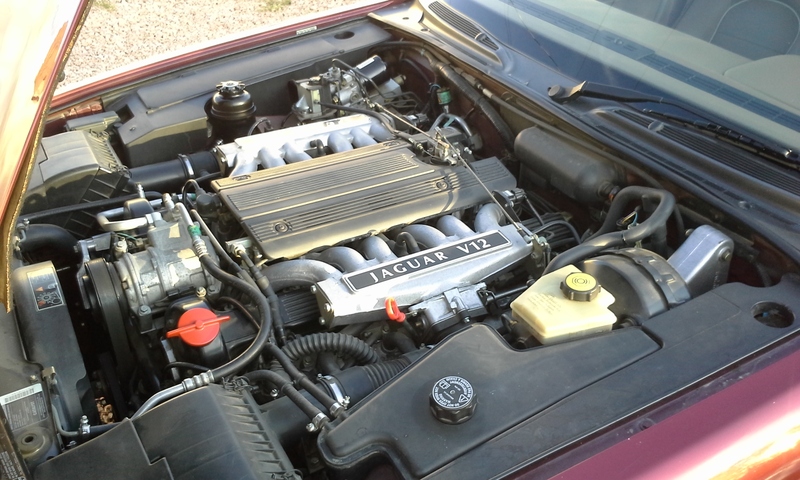 The X300s in general are scarce, but an XJ12 is about as rare as a real Jaguar in the Arizona wilds. Only a few are known to exist out there! I've not been active on the forum lately, so I've not kept up much. But I'm back now. I made some changes the last few months, downsizing to only one Jaguar, the XJ12. My son bought the XJ6 (so it's still in the family), and the shell of the Vanden Plas was sent away last June, leaving me with plenty of spares. I've used about 25 items from that car on the other two so far, and that is valuable. The XJ12 just turned over 80,000 miles, and she indeed purrs like a big cat should. I've had very few issues with the car, the most recent being a broken vacuum hose to the cruise control that was easy to diagnose, and free to fix! She's got a bit of oil seeping from the under areas, but nothing serious. And, the clock has finally gone intermittent. The VDP donated a rear bumper blade, a driver's side window trim and a wheel. The car is a joy to drive, and I am happy to drive it more often now. My son is becoming a Jaguar fan, now that his friends compliment him on his car! I suppose we will keep him in the family too. I always assumed that the published numbers for North American Spec XJ12s (from Wikipedia): 564 for 1995 MY and 535 for 1996 MY, would all have been sent to the United States, since they were all equipped with the OBDII system and the 5-mph bumpers. Those are the numbers of cars quoted in the US EPA violation settlement too. That is a very small number of cars, for one of Jaguar's biggest markets. I don't think Jaguar would have had any trouble selling them all pretty quickly back then. If fewer came to the USA, where did the rest go? Directly to Canada or Mexico as part of the North American Spec? XJ12s were made for the rest of the world too, with 673 SWB and only 56 LWB made from 1994-1997. You've probably seen member Fritzvis (Frederik) has a UK RHD SWB XJ12, in (or near) Belgium. The Daimler Double Six was more plentiful, with 2,237 made, but none of these were meant for the USA. I may never see another X305 XJ12 in person, but that's understandable considering it's rarity. That only adds to the special quality and charm of this beautiful machine. Last edited by SleekJag12; 12-29-2015 at 02:32 AM. Hi Sleekjag, nice to hear from you and that your cat is doing well. My 96 has all lights required for driving working now. So I will finally finish cleaning the inside and putting back the few bits of interior trim that had to be removed to access everything. Then I shall be off to the TAG office to transfer title into my name, get a tag for her and ad her to my insurance. After that she will be heading to the paint shop, clearcoat is looking bad. The previous woman owner left her sat out in the Florida sun to bake. She just had no respect for the car. My 95 is parked in the garage for now, she is a beautiful machine, and absolutely spotless, but has now a strange fault. On initial start up, she runs happily on all 12 cylinders, but when she warms up, 10 to 15 minutes, for some reason the ECU is shutting down the entire A bank of fuel injectors. I have read that if the ohm resistance seen by the ECU is out of the norm on as little as two injectors, the ECU will shut down the entire bank. A job for the New Year, stick the ohm meter on and see if that is my problem. 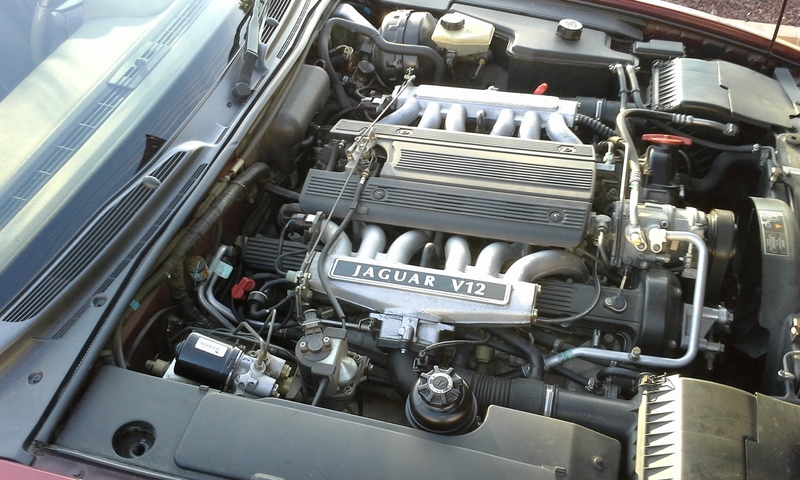 Then there is my 91 XJ6 Sovereign which I have not used in 8 years, she fires up well and runs but I need to change the fan belts, and my 92 XJS V12 convertible, which has not been on the road for 6 years, also an immaculate car, needs a new water pump. I'm still looking for those bargain XJ12's, that is the ones that need some work, time and a little cash which I can restore to their original beauty. A quick tip. The 95 on xj6 and xj12 tag light fittings are $82.00. Most likely problem as mine was that the metal strips which hold the bulb corrode. Remove the fitting from vehicle, pull out the corroded metal strips, and utilize the metal strips from an earlier model xj6. They will slide in to the slots perfectly and just require a little bending to hold the bulb. Save $82.00. Happy New Year to all XJ12 owners out there and of course any other readers of my thread. Good work restoring the 96. It is sad to see them in disrepair, and rewarding to bring them back! I felt bad about having to retire my Vanden Plas, but that car was not as rare or special. Strange problem with the fuel injectors shutting off in the 95. Your plan to check them with the ohmmeter sounds like a good first step. Check the wiring harness leading to the A-bank injectors for continuity. Maybe the heat causes an open circuit at a weak point somewhere. Next project should be to bring back another big cat, your 92 XJS! Hey Sleekjag. Yep I hate seeing these cars go to the scrapyard in the sky. I think if the injectors on the 95 turn out to be ok, I am going to let a couple of mechanics who used to work for the local dealership and now work for themselves, and by all accounts have a good reputation, take a look at her. I think there are or is at least one pic of her on here, She is a beautiful machine and even after 20 years still has that new leather smell. Saw a 96 xjr for sale last night, $2,500. Body looks good as does the interior but no mention of mileage. Yeah my 92 xjs is gonna get me in trouble one day. I used to speed a lot in my young and daft days, now, 64 I generally slowed down, but I do like taking the xjs out on the interstate in the middle of the night and letting her fly. The project I should really get to is my 85 xjs V12 HE coupe, It has a genuine 97,000 miles on it, That is a pretty involved restoration, although I did drive her back to Florida the day I bought her in New Jersey, so mechanically she is fine. Probably going to use my 91 Sovereign as a runaround car when I do fan belts on her. I need two lives to have time. LOL. Thanks for the info xj12nv. Bit too far away, I'm in Florida, and also just put an offer in on a foreclosed house. More time renovating. Maybe three lives is what I really need to keep up with everything. Now of course if I win the powerball tonite, distance would be no object. Not much chance of that though. I can dream. Quick Reply: where have all the big cats gone?